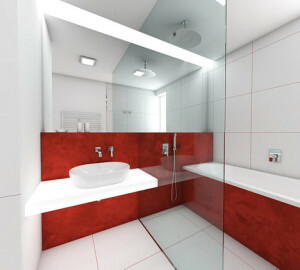 In the bathroom, the mirror is indispensable and the glass shelves and screens are also well known and popular. However, there can be also other glass objects in the bathroom. We are going to give you some information, which parts of the bathroom equipment can be made of glass and which of them you can buy for your home. Do you like glass in the bathroom? It makes the space lighter, it makes some objects subtler while it highlights others, and it is certain to increase the whole design level of the space. In addition to small accessories (such as soap holder, cups or shelves), the screens around the bathtub and the bathroom mirrors, other parts of the bathroom can be made of glass, as well. The glass wall panels, more or less open screens and mosaics are increasingly popular. Glass is also used for furniture, sometimes even for the sanitary equipment, the lighting andr the door. The glass is practical, as it mostly forms a smooth surface that is easy to maintain. The glass used for larger areas is made firmer by hardening, so that it becomes almost unbreakable during normal use. It can be easily combined with other materials. The stained glass does not fade its colour while the clear glass brightens the space. If you solve the problem of the lack of light, a skylight or a glass door will be helpful. And finally, the glass can take over the function of the lighting in part. Even by replacing some small elements, your bathroom´s look may improve noticeably. If you want to choose several accessories, make sure they are not in various designs and implementations. Do not combine rounded shapes with sharp shapes or clear glass with matte glass, you should also pay attention to the unification of the chrome parts. The mirrors can be replaced easily. If you want to enlarge the room visually, use the mirrors without the frames. 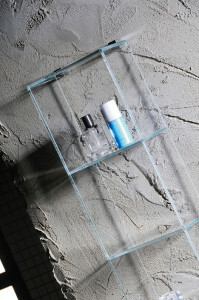 The glass shelves as well as the galleries with storage space are common in the bathrooms. Glass can however be also used for the furniture, usually on its front surface. The glass can carry a graphic motif or a LED diode strip, which is designed for wet conditions, an expert says. The glass panes are a clever solution, too. 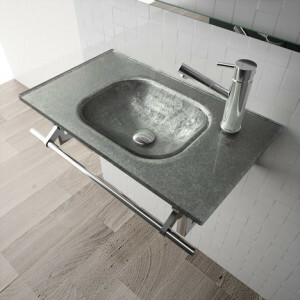 Glass and artificial stone are the best materials for the wash basin boards. Other materials get damaged through normal use or they are sensitive to prolonged exposure to water, a designer adds. You can line the walls with mosaics, however the new trend prefers large glass tiles, which are usually stuck to the wall (you can stick them even on the existing ceramic tiles, provided they are even and technically sound). They have no joints, which could keep dirt or mould in, and they can be decorated with any motif. The basins made of tempered safety glass are the most frequent. The conventional minor bumps do not damage them unless hit heavily, when a crack appears at the point of the impact. However, the basin will not break into pieces and it will always retain its shape. The screen can have many forms: it can be fixed, partially fixed or entirely movable. You can combine the solid panel with the hinged one and the shapes are numerous, too. The glass panel can sometimes work as a dividing element, which partially divides the space. Glass can be chosen in many variants: it can be clear, frosty, stained, sandblasted or it can have a decorative motif. The glass can have different kinds of surfaces, which make its maintenance easier. They include the anti-plaque treatment, which causes the water to flow down in trickles, so it flows faster and does not leave any drops. The sediments from the water still get partially captured on the glass, but they can be cleaned more easily. The “Anti Calc” treatment prevents the scale and the condensation of water vapour from forming; they both lead to the unsightly drops and “maps” on the glass. The mirrors can have the anti-fog treatment. The clear glass does not create a visual barrier in the room. For example, a small bathroom with a glass shower screen looks more open than if you used a shower curtain or a brick partition. The nanotech products can be applied retroactively virtually on every surface which is clean and free of grease, including the surfaces in the bathroom. They contain nanoparticles, which fill every microscopic unevenness of the surface and create a protective film, on that nothing gets stuck. This kind of surface is also antibacterial.